The EverGo Portable Oxygen Concentrator is a great economical choice for oxygen dependent individuals requiring a portable oxygen concentrator for mobility. Sleep Restfully, Inc of Houston, Texas has been supplying the EverGo Portable Oxygen Concentrator since its introduction by Philips Respironics almost 5 years ago. Many believe that this work horse portable oxygen concentrator will take a back seat to the newly introduced SimplyGo Portable Oxygen Concentrator. That may not be the case. Since many people only need a portable concentrator for while active and pulse dose will meet their medical need at a significantly lower cost it should continue to be the right choice for many. 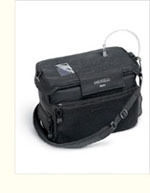 The EverGo Portable Oxygen Concentrator fills a valuable slot in the portable oxygen market. The EverGo Portable Oxygen Concentrator was the first pulse dose unit introduced that provided up to 8 hours of use at a pulse setting of 2 on a single charge. This is a huge advantage for many oxygen users who want a portable concentrator to continue a normal and active way of life while on oxygen therapy. The EverGo comes with the portable oxygen concentrator, AC Adapter, DC Adapter, Airline Connector, Carry bag with shoulder strap, Wheeled Cart, 2 Batteries and a 2 year warranty on the unit, 1 year on batteries and accessories. The EverGo operates on dual voltage making it usable anywhere in the world. Sleep Restfully, Inc. is proud to be a distributor for the Philip Respironics EverGo. Sleep Restfully, Inc. prides itself on the high quality customer service it provides to Sleep Therapy and Oxygen customers. Their slogan, “We may not be able to match everyone’s price but no one can match our service” is exemplified by their Better Business rating of “A”. They carry a complete line of sleep therapy equipment and supplies by ResMed, Philips Respironics, Fisher & Paykel and other manufacturers. In addition to CPAP machines and CPAP supplies, Sleep Restfully is your portable oxygen concentrator specialist offering the best prices and support for portable oxygen concentrators such as the Respironics SimplyGo, Respironics EverGo, Sequal Eclipse 3, Inogen G2, Invacare XPO2 and more. They also sell stationary oxygen concentrators such as the Philips Respironics EverFlo and Invacare Perfecto. In addition, Sleep Restfully stocks all replacement parts for the CPAP machines and CPAP mask as well as replacement parts for all portable oxygen concentrators. Sleep Restfully, Inc. can be contacted toll free at (866) 923-2727, or by visiting their website sleeprestfully.com.